Deer hunting season is upon us, in full swing. And it’s AWESOME! I don’t personally hunt, but J does and he’s been going out every weekend since the season opened. They hadn’t really been seeing anything the past few weekends, but that all changed this past Saturday. Not only did he get a deer, he got a buck with a HUGE body. You know what that means? Lots of deer meat!! Mmm, mmm!! I did discover, however, that while I love venison I am not at all interested in seeing the process of getting it to my freezer. Ick, ick, ick! We took most of the meat to be processed into my most favorite venison product – dried sausage!! OMGoodness I could eat that stuff all.day.long. I already told J I’ll give him 1 ring, but the rest is MINE! I’m sure you can imagine how well that went over. Ha! We’ll also have some chili meat and ground hamburger made up from the other half of it. I can’t wait!! We kept the back strap – which was huge! – the tenderloins, and 1 rack of ribs. Usually the ribs are worthless because they don’t really have any meat on them, but this buck was so big that there is plenty of meat on them! This deer was also an old boy, so we worried about the meat being tough. And it was a little tough. Not sure though if it was the meat itself, or if I cooked it too long. Be sure not to overcook it…because that will most definitely make it tough. The flavor was great, though. Not too game-y, and the sauce was awesome! So, for dinner last night, I made use of some of that back strap. Pan-seared and then finished off in the oven, smothered in a red wine and balsamic sauce with shallots and garlic. Yeah. I did that. And you should too. Remove the silver skin from the back strap and season to taste with salt, pepper, and Italian herbs. Heat 1 tablespoon of olive oil in a large, oven-proof skillet over medium-high heat. Add the back strap and sear on all sides, about 2-3 minutes to get a nice “crust”. Transfer the skillet to the pre-heated oven and cook for 15 minutes, or until it reaches about 145-150 degrees, or to your desired doneness. This temp will get you close to medium doneness. If you don’t like as much pink, cook it a little longer, but be careful not to overcook it or you will get tough meat. Also, it will continue to cook some after you remove it from the oven, so take that into consideration. Remove from the oven to a cutting board or serving platter and tent with foil for about 5 minutes to rest and let the juices settle. While the meat is cooking, prepare the sauce. In a medium saucepan, heat the olive oil over medium heat. Add the shallots and the garlic and saute until the shallots soften, about 5 minutes. Season with salt & pepper. Add red wine and increase to medium-high heat. Cook until it starts to boil, then add the balsamic vinegar, reduce the heat to medium-low and simmer uncovered, until slightly reduced, about 10 minutes. Add the butter and stir until melted and mixed in. 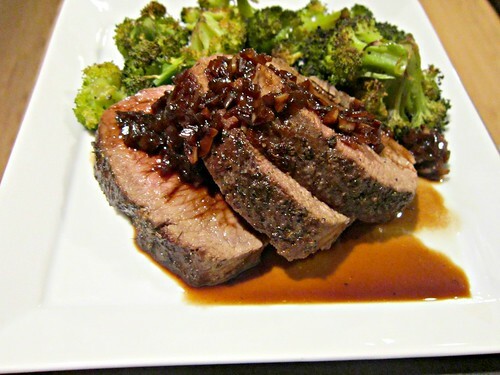 Slice the back strap into 1/2-inch medallions and serve with the red wine sauce and your favorite sides. Not a lot of venison to be had around here, but I trust you!